Most funds available for Pro Bono Publico Foundation grants are contributed by members of the Rex Organization, but all donations are welcome. Individuals, foundations, and corporations wishing to support the transformation of education in New Orleans may find the Foundation’s focus on careful investment in this process an appealing option for giving. The Pro Bono Publico Foundation is a 501(c)3 entity, and all donations will be acknowledged and are deductible to the full extent allowed by law. 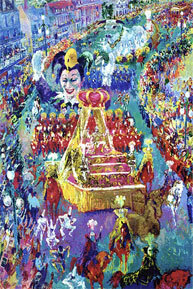 On February 19, 2007, the Foundation received its first, very generous gift: Leroy Neiman, the well-known artist, donated 75 serigraphs of his painting, “Mardi Gras Parade.” Proceeds from the sale of these signed serigraphs, valued $3800 each, will go directly to support the education of New Orleans’ children through grants made by the Pro Bono Publico Foundation. For information on purchasing Mr. Neiman’s “Mardi Gras Parade,” please email info@probonopublicofoundation.org.